Situation: I'm new to the world of trike maintenance. My son and I purchased recumbent trikes at the end of last summer. The weather for the past couple of months has been cold, snowy, cold, and...cold (Northern Pennsylvania climate.) So I cleaned them, tried my hand at lubricating the chains for the third time since owning them, and put them up in the shed to keep them out of the sun and precipitation. On soliciting some info, I was told that is "definitely rust." Apparently I didn't do something right when I put them in the shed for a month of storage, or rust is not easy to fend off. As I said, I'm new to this, and trying to improve maintenance skills. I'm hoping this isn't so bad that the chains require removal or replacement at this point. How bad in shape are these chains, relatively speaking? I have yet to find a definitive answer to this; how do I clear off the rust? WD-40, followed by degreaser and relubricate them? These are chains that came stock with the trikes. I wonder if the future fix is to get a particular type of rust-resistant chain? As long, as you can easily move the links of your chain, there's no problem. Just lube them and ride them, and they'll be fine. The movement will rub any rust from the critical places. You may need to work the chain for a while before the links become free, a creeping oil should help get the links moving again. Make sure they are always well-lubed. A surface that's covered by oil is not covered by humid air, and cannot rust. May work well during storage, not so well when you actually use the bike. Use chains with an anti-rust coating. I have quite good experiences with this, though the chains are a bit more expensive. I'm not sure how robust the anti-rust coating is against sliding through a front deraileur, though (I only ride IGH). In any case, I've never had a rust-proof chain go stiff. Chains are consumables, so there's nothing wrong with replacing the chains if they don't move freely. Downside is each may require three times the chain of an upright bike so the cost soon skyrockets. If the chain functions okay, don't bother replacing them. If you just want to make them look better, then you can take the chain off, degrease the outside, lay it on its side and give it a light spray with black anti-rust paint like Rustoleum. Give it time to dry and harden, then either refit with the painted site outwards or flip the chain and paint the other side before refitting. Once fitted do relube all the rollers in the chain. I have a dutch M5 highracer and the chain is about 275 links long. I started with $9.99 7 speed chain that worked reasonably well, and suited the 7 speed cassette. Then I changed to an Alfine 11 speed IGH, and the 7 speed chain worked fine there as well. When it was overworn I changed to 10 speed chain and the only noticable change was a decrease in chain/tube friction. Not the answer you're looking for? Browse other questions tagged maintenance chain rust or ask your own question. Are there brands that sell weather-resistant chains? How long should a well maintained chain last and what can I do to prolong its life? Is my bike getting ruined? How do I fix U brakes? 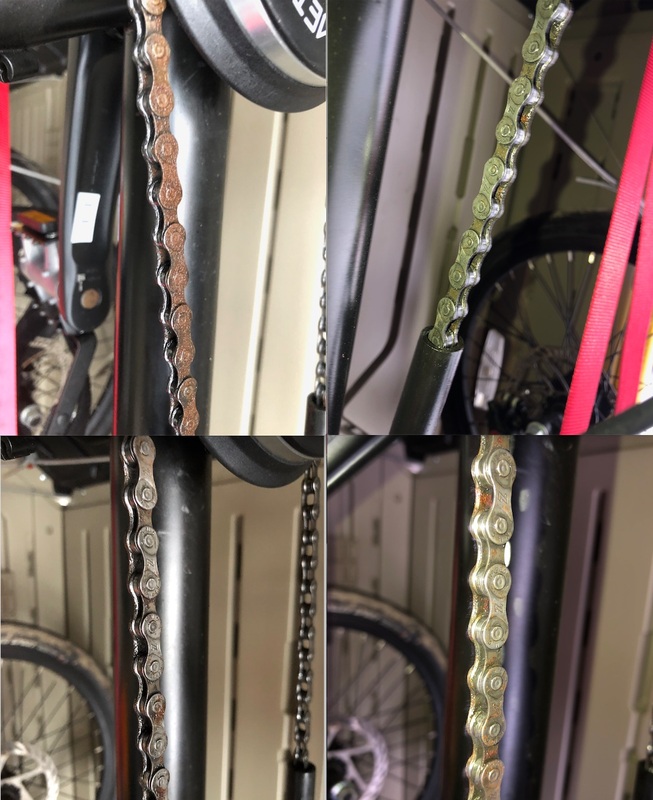 Is it possible to over-clean a bike chain? My fork stem is rusted - should I replace the forks? How can I dry a chain?